How Does a Distribution From a 529 Plan Get Reported? When you withdraw money from your 529 education savings plan, which is a qualified tuition program, it’s called a “distribution.” Reporting these withdrawals on your tax return depends on whether your distribution is qualified or nonqualified. If you receive a qualified distribution, you typically won't have to report the transaction on your tax return. But if you receive a nonqualified distribution, you’ll have to report the earnings as taxable income, and you may also have to pay a 10 percent federal tax penalty. Named for Section 529 of the Internal Revenue Service Code, the Securities and Exchange Commission describes 529 plans as tax-advantaged savings plans that incentivize taxpayers to save for the costs of education. These plans are offered by educational institutions, states and state agencies. All 50 states and Washington, D.C., offer at least one type of 529 plan, but you typically don't have to be a resident of a state to invest in its plan. Although contributions to a 529 plan are not tax deductions, the interest that you earn on your contributions is tax-free as long as you take qualified withdrawals. The person or other entity, such as a financial institution, that manages your 529 plan is responsible for reporting distributions to the IRS and to you by issuing IRS Form 1099-Q (Payments from Qualified Education Programs [Under Sections 529 and 530]). In Box 1 of your 1099-Q, you’ll see your gross distributions, and in Box 2 you’ll see the amount of your earnings. Box 3 shows the contributions to your 529 plan – called the “basis.” These three boxes form a simple mathematical equation – the amount in Box 3 equals the amount in Box 1 minus the amount in Box 2. If the amount of your annual 529 annual distribution is equal to or less than the amount of your adjusted qualified educational expenses, you won't owe federal income tax on this distribution. Your “adjusted” educational expenses include the total of your qualified expenses minus any other tax-free educational assistance you may have received such as a Pell grant or scholarship(s). For example, if the total of your qualified educational expenses is $10,000, and you receive a scholarship of $2,000, your amount of your adjusted expenses is $8,000. If Box 1 of your 1099-Q shows $8,000 or less, the amount of your 529 distribution is tax-free, and you do not have to report the distribution as income on your tax return. If you receive more in a 529 annual distribution than the amount of your adjusted qualified educational expenses, the amount of earnings reported in Box 2 of your 1099-Q may be subject to federal income tax. Calculate any taxable earnings by first calculating your tax-free earnings. Multiply the amount shown in Box 2 by a fraction, whose numerator (top number) represents your adjusted qualified education expenses that were paid during the tax year and whose denominator (bottom number) represents the total amount of 529 distributions you received during the same tax year. Then, subtract this amount of taxable earnings from your total distributions to figure your tax-free earnings. Putting actual numbers to the calculation, let's say your 529 earnings (the amount in Box 2 of your 1099-Q) are $950, your adjusted qualified education expenses are $5,200, and your total distributions (the amount in Box 1 of your 1099-Q) are $5,300. Using these numbers, the amount of your tax-free earnings is $932 ($950 x $5,200/$5,300), and the amount of your taxable earnings is $18 ($950 - $932). Enter $18 as taxable income on Line 21 of 1040 Schedule 1 as the amount, which you'll note as "distributed QTP earnings not used for adjusted qualified education expenses" in the field beside Line 21. If you have a taxable 529 distribution, you’ll typically owe a 10 percent withdrawal penalty in addition to the income tax on the taxable earnings portion of your distribution. Report any taxable earnings on Line 50 (excess contributions) of IRS Form 5329 (Additional Taxes on Qualified Plans [Including IRAs] and Other Tax-Favored Accounts). The instructions for this form can help walk you through any questions you have. You’ll find Form 5329 and its instructions by visiting IRS.gov/forms and searching for them by number. Distributions that are paid to a 529 plan beneficiary (or the estate of the beneficiary) on or after the beneficiary’s death. Distributions that are paid to a beneficiary who becomes disabled. A physician must provide documentation that the beneficiary’s disability is of long-continued and infinite duration, or that the disability is expected to result in death. Distributions that are included in income because the beneficiary received a tax-free scholarship or grant, veterans’ education assistance, employer-provided educational assistance or other nontaxable payments received as educational assistance (except for gifts or inheritances). These, and other exceptions, are outlined in IRS Publication 970, which you can find by visiting IRS.gov/forms and searching for this publication by number. Prior to the 2018 tax year, 529 plans were geared toward post-secondary educational institutions, including colleges, universities and technical schools. But beginning with tax year 2018, the Tax Cuts and Jobs Act widened the net of qualifying schools to include eligible kindergarten through grade 12 institutions, whether public, private or religious. For these schools, you can spend up to $10,000 from your 529 plan to cover qualified tuition expenses. To claim tax benefits for your 529 plan contributions, the school you choose must qualify for these benefits. The IRS defines an “eligible educational institution” as one that primarily presents a curriculum of formal instruction, maintains a regular faculty and typically keeps a regularly enrolled student body that meets at the place of the institution’s educational activities. In addition to making sure that your chosen educational institution qualifies for 529 tax benefits, you’ll also want to make sure that you use your distributions for eligible tax-free expenses. Along with tuition and enrollment-related fees, other allowable expenses include course-related costs such as books, course fees, supplies and equipment required for a course of study at the eligible school. On the flip side, 529 plans also have ineligible expenses, defined by the IRS as room and board, travel, research, clerical help and other expenses, such as equipment, that are not required for enrollment or attendance at an eligible school. Fees vary widely among different 529 plans. 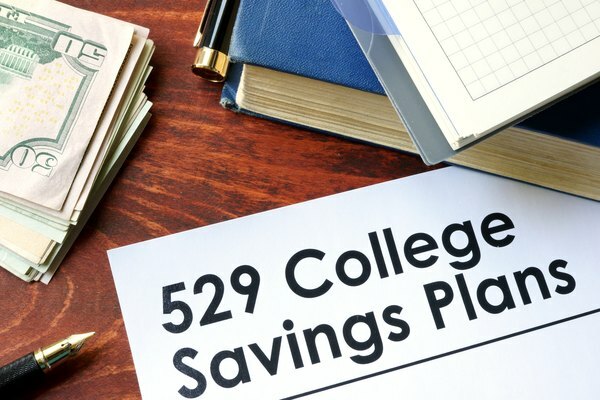 State-sponsored plans do not guarantee 529 education savings plan investments, although some 529 plan investments in bank products may be insured by the Federal Deposit Insurance Corporation. A 529 plan is an investment, which carries investing risks just as other types of investments do. The SEC urges potential 529 plan investors to perform their due diligence by reading all the details contained in a 529 plan's offering circular before making their investment decision. Are Earnings on a 529 Plan Federally Taxable? Can I Draw From a 401(k) for a Home Purchase Without Being Penalized With Taxes? Can I Invest in a Roth 401 as Well as a 401(k)? How Much Money Can You Put Into a 529 Plan? Are Distributions From a Roth IRA Taxable?